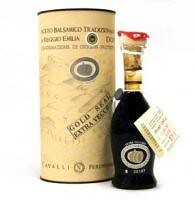 Cavalli Gold Seal Extra Vecchio, considered by many ottimo, or best, of balsamic vinegars, is a treasure you'll want to experience. We just received a new shipment of this 25-year-old balsamico, aged to painstaking standards near Scandiano on the high plains of Reggio Emilia. Cavalli Gold Seal is as rare as it is precious, aged in a series of fine wood caskets to develop its intensity and layers of flavor. As with any balsamic this expensive, we suggest tasting by droplets, perhaps on some fine Aged Parmigiano-Reggiano. Some balsamico lovers sip it from tiny porcelain spoons.